With its vast wilderness areas and spectacularly diverse scenery, Africa is one of the world’s best continents for multi-day hiking. Whether you’d like to scale mountains, explore sublime deserts or hike through old forests, there are many options for fantastic hikes to do. Here we’ve rounded up some of Africa’s best epic hikes to put on your bucket list that take in a range of landscapes. If you’re up for a challenge, Mount Kilimanjaro is a must do. Africa’s highest mountain – a dormant volcano – is also the world’s tallest walkable mountain, which means you don’t need any mountaineering experience or technical climbing gear to make the summit. 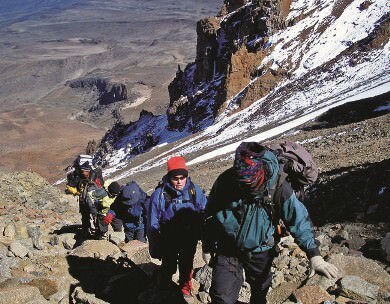 There are several routes to reach the top, each taking about five days to reach the 5986-metre high summit. On your way to the summit, you’ll hike through five different climates and some beautiful scenery, from rainforest to the summit’s otherworldly moonscape of rock and glacier. One of the greatest long-distance treks in the world, the Rim of Africa hike is a whopping 650 kilometres. The trek starts in the Cederberg Wilderness Area in the Western Cape and takes you across the Cape Mountains and some truly amazing scenery along old paths, trails and ridge lines to end at the foothills of the Outeniqua on the Garden Route. While you can hike the entire route from September to November each year, you can also do shorter sections of the hike, each of which takes a week to complete. Africa’s second tallest peak, Mount Kenya is an ancient dormant volcano covered in bamboo and rainforest home to elephant and buffalo, Afro-alpine moorland, snow and glaciers. There are three peaks to scale and five different routes to choose from, each taking between five and seven days and requiring a decent degree of fitness and some technical knowledge. One of the world’s largest canyons, the Fish River Canyon is jaw-droppingly magnificent. The best way to take in its vast beauty (and 1.5 billion years of geological history) is by doing the 90-km Fish River Hiking Trail, a seven-day hike through the canyon, which guarantees dramatic scenery, hot springs and amazing desert nights under the stars, encircled by the canyon walls. The Drakensberg range is the tallest set of mountains in South Africa, and what a spectacular range it is. The best way to see these mountains in all their glory is to tackle the 250-km hike across the length of the peaks, which starts in the Free State and ends in KwaZulu-Natal. It’s certainly tough going – there is no trail and you’ll need to scale the six highest peaks in the mountain range – but if you’re after a hiking challenge then you’ll get to experience some of the country’s most beautiful mountain landscapes. The highest peak in North Africa, Jebel Toubkal towers over 4000 metres in the Central High Atlas mountains, rewarding hikers with incredible views once they make the summit. It takes two to three days to trek to the top (if you’re reasonably fit) and it’s accessible to beginner climbers. A World Heritage Site, Ethiopia’s Simien Mountains are made up of pinnacles (some soaring over 4500 metres), plateaux and valleys that are home to ibex, wolves, gelada and caracal. Hiking these mountains, known as the Roof of Africa, is all about experiencing extraordinary landscapes: deep gorges, streams, waterfalls and cloud-wrapped hills and peaks. It’s easy to see why the Otter Trail is one of South Africa’s most popular hikes (you need to book a year in advance for it). The 42-km route is a scenically stunning trail along the beautiful unspoilt coastline of the Eastern Cape which takes in unspoiled sandy beaches, clear rock pools, beautiful rivers, enchanting forests, endless fynbos and wild flowers. Mt Mulanje, Central Africa’s highest peak at 3000 metres, is a spectacular place to go hiking, with a wealth of trails to choose from that take you through dramatic green valleys, forests and waterfalls. If you want to scale the peak itself, there are six routes to the top. Along the way there’s lots of wildlife to spot, from from monkeys to dassies. The immense Namib-Naukluft National Park conserves a large tract of the Namib Desert, one of the oldest deserts in the world. Much of the park is inaccessible to visitors, but in its eastern section is the Naukluft Hiking Trail, a 120-km route that allows you to explore this wild and beautiful place on foot. The hike takes eight days and leads you through scenery of river gorges, valleys, waterfalls (with some places to cool off from the fiery sun) and patches of the unique-looking quiver trees. Just over 100km long, the six-day Amathole Trail starts in King Williams Town in the Eastern Cape and winds its way through amazing highland scenery of mountains, old Afro-montane forests, valleys, streams and waterfalls before ending in the picturesque village of Hogsback. If you’re up for strenuous long days of hiking, the trail will reward you with the scenery that inspired JRR Tolkien to write his Lord of the Rings novels. Inspired to go tackle one of these hikes? Browse our budget African overlanding tours to Kenya, Tanzania, South Africa, Namibia and Malawi to start planning your trip.